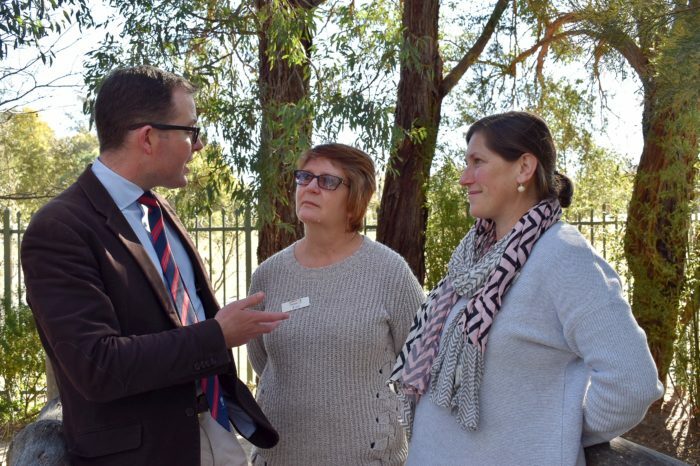 Northern Tablelands MP Adam Marshall discussing the funding windfall for St Peter’s Preschool in Armidale with Dierctor Jane Schutz and teacher Natalie Rich. NORTHERN Tablelands MP Adam Marshall has delivered a double whammy win for Armidale’s St Peter’s Preschool today, with NSW Government grant funding of $19,500. Mr Marshall said the funding will allow the preschool to increase the quality of its service and the education environment for young children and their families. “Extra funding for early childhood education is always welcome and this grant will improve the little world of little kids at St Peter’s learning about life in environments where there is a high standard of care and community,” Mr Marshall said. Mr Marshall has delivered news of a $15,000 grant under the NSW Government’s Quality Learning Environment and $4,500 from his government’s Community Grants program. St Peter’s Preschool Director Jane Schutz, said the centre would use the larger grant to provide a bathroom upgrade at the O’Dell Street property. “We need a new inclusive bathroom so that children have some private space,” Ms Schutz said. Ms Schutz said the remaining funding would be used to increase the teaching skills of St Peter’s educators. “The funding will go towards sending our staff to two workshops that educate staff on how to better aid Aboriginal students on the transition to school,” she said. Mr Marshall said St Peter’s was showing an ongoing commitment to ensuring children in the Northern Tablelands have access to top quality early childhood education. “And as the local member, that commitment makes me extremely proud,” Mr Marshall said. “Funding like this not only improves the quality of the learning environment for children but additionally parents can also rest assured their children are having the best start to their educational journeys as possible. The Quality Learning Environments program was introduced in 2018 and is part of the NSW Government’s $332 million Start Strong Program which was introduced in 2016 and has been extended to 2021.